The Hobbit (1937; 365 pages): Although Tolkien was already at work creating The Silmarillion, this children’s story was published with the idea that none of it would ever see the light of day, so he played fast and loose with his own mythology and the whimsical Hobbit was only reconciled into the larger story after its publication. In the original version of The Hobbit Gollum actually gives Bilbo his magic ring as a gift, but Tolkien re-wrote the chapter before publishing Lord of the Rings. Instead of ignoring the original version, Tolkien made the two versions the basis for Bilbo’s lying about how he got the Ring. The Lord of the Rings (The Fellowship of the Ring, 1954, 398 pages; The Two Towers, 1954, 322 pages; The Return of the King, 1955, 406 pages): When asked to write a sequel to The Hobbit, Tolkien preferred to just have The Silmarillion published but instead was asked to write something in the same vein, so he created the epic fantasy drawing on his unpublished mythology. Usually referred to as a trilogy, even by fans, Tolkien was insistent that it be considered one book. The Simarillion (1977; 365 pages): Tolkien died before completing The Silmarillion, but his son Christopher Tolkien was able to reconstruct his father’s vision from the various versions written over the years. 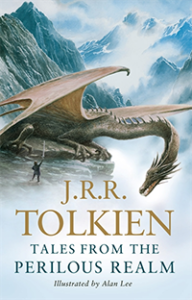 Unfinished Tales (1980; 472 pages): Christopher Tolkien would soon publish a twelve-volume History of Middle Earth going over nearly all of his father’s writings that the published Silmarillion was compiled from. Unfinished Tales is sort of sampler of that project – a collection of various drafts and documents, mostly unfinished. This includes a sort of “deleted scene” from Lord of the Rings in which Gandalf and Frodo discuss what happened in The Hobbit as it relates to Lord of the Rings. Those wanting to know more about Numenor and the Second Age should check out the tale of Aldarion and Erendis in this book. The History of Middle Earth, Vols. 1-2: The Book of Lost Tales (Volume 1, 1984, 304 pages; Volume 2, 1984, 391 pages): A lost mariner accidentally journeys into the faerie realm and is told the history of the gods and elves – this is the early version of The Silmarillion begun by Tolkien during World War I. The History of Middle Earth, Vol. 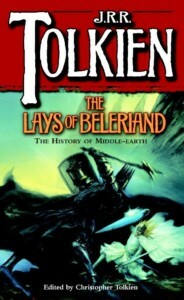 3: The Lays of Beleriand (1985, 465 pages): In the 1920s, Tolkien began re-writing some of his Lost Tales in poetic form. This is some of his best work and if you enjoyed the poetry of Lord of the Rings, the alliterative poem of Beren and Luthien is the place to go next. The History of Middle Earth, Vol. 4: The Shaping of Middle Earth (1986; 380 pages): Tolkien singled out three “Great Tales” from his mythology that he had been writing in both prose and poetic form – Beren and Luthien, The Children of Hurin, and The Fall of Gondolin. In order to give the background to understand those stories, Tolkien began writing The Silmarillion. The History of Middle Earth, Vol. 5: The Lost Road and Other Writings (1987; 503 pages): In the late-1930s, Tolkien and his friend C.S. Lewis made a bargain: Lewis would write a space-travel book (Out of the Silent Planet, 1938, 158 pages) while Tolkien would write a time-travel book. Tolkien’s unfinished time-travel book is here, telling the story of a young man who, through dreams, finds himself in the Atlantis-like kingdom of Numenor. Tolkien would draw this into The Silmarillion, making the tale of Numenor the focus of the Second Age of his world. The History of Middle Earth, Vols. 6-9 (The Return of the Shadow, 1988, 497 pages; The Treason of Isengard, 1989, 504 pages; The War of the Ring, 1990, 476 pages; Sauron Defeated, 1992, 482 pages): These are the original drafts of Lord of the Rings, but Volume 9 has a special surprise – The Notion Club Papers – Tolkien’s second atte mpt a time-travel novel to Numenor. The History of Middle Earth, Vols. 10-12 (Morgoth’s Ring, 1993, 471 pages; The War of the Jewels, 1994, 470 pages; The Peoples of Middle-earth, 1996, 482 pages): These last three volumes in the series focus on Tolkien’s post-Lord of the Rings work on The Silmarillion. Volume 12 contains a not-so-great attempted sequel to Lord of the Rings, but Volume 10 has the real jewel – the “Athrabeth Finrod ah Andreth” – a philosophical debate about mortality between an immortal elf and human woman. The Children of Hurin (2007; 313 pages): Unfinished Tales introduced us to a novella-length version of the Children of Hurin, told here in a self-contained narrative. This is probably one of Tolkien’s more accessible works after Lord of the Rings, but it’s also pretty grim and in some ways has more in common with A Game of Thrones than Lord of the Rings. 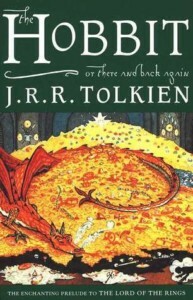 Tales from the Perilous Realm (2008; 403 pages): This is a collection of some of Tolkien’s shorter works, and only the Tom Bombadil poems have to do with Middle Earth, but the comedic dragon-tale Farmer Giles of Ham is probably the next best thing to read for fans of The Hobbit after Lord of the Rings. If, however, you only read three of Tolkien’s works, it’s best to go with The Hobbit, The Lord of the Rings, and the essay “On Fairy Stories” included in this book. Beren and Luthien (2017; 288 pages): Unlike The Children of Hurin, this is not a long, sustained version of the Beren and Luthien tale, but reads more like a one-volume edition of the History of Middle Earth, focusing only on the story of Beren and Luthien and tracing its development through Tolkien’s life. The Fall of Gondolin (2018; 302 pages): Ninety-three-year-old Christopher Tolkien declared that The Fall of Gondolin – in which he traces the evolution of his father’s oldest tale as he did in Beren and Luthien – to be his last book. Tolkien’s posthumous publications have either come to an end or are about to enter a whole new age.